Liars: Theresa May (left); Brexit Secretary David Davis (right). Theresa May and David Davis want us all to accept their word that they won’t use ‘Henry VIII’ powers to rip up the rights of UK citizens if the EU Withdrawal Bill – in its current form – makes it onto the statute book. But we would be fools to believe her. She can’t even be trusted to be honest about the reasons she thinks she should be allowed these powers. 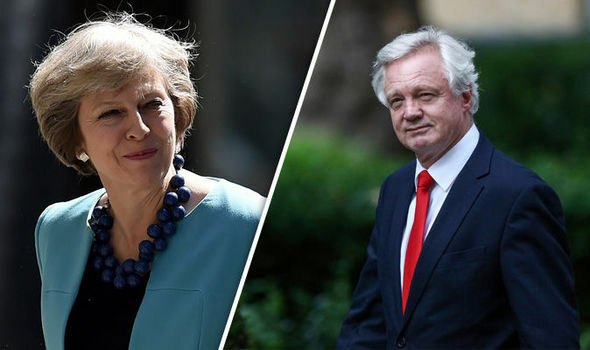 Lords have accused Theresa May and David Davis of “selectively” quoting from their inquiry report and claiming it endorsed their Brexit legislation, when actually the study raised major concerns. Peers on the Constitution Committee said they had in fact called for a “number of key limitations” to be placed on the legislation. Baroness Taylor of Bolton, Chairman of the Committee, said: “The EU (Withdrawal) Bill represents an extraordinary transfer of legal powers from Parliament to the Government, without the additional oversight we recommended. “We believe this will create very real difficulties for Parliament in fulfilling its constitutional role to scrutinise this Bill. It wouldn’t be quite as bad if Mrs May had a record of supporting citizens’ rights – but she doesn’t. Time and again, the Tory leader has led or voted in favour of draconian attempts to cut down on the rights of working people and their protections against unscrupulous bosses. That’s according to the Daily Mirror, which provides a handy list of seven such incidents. You can read it here. Think carefully folks! If Gvmnt wins vote today, *all* EU laws, hard-fought/safeguarding, will be subject to unopposed repeal by Ministers. You can’t trust Theresa May. She must not get these powers. Trusting T May is like trusting an employee who writes their own reference and expects it to be signed off without hesitation, but who would do that, surely not our esteemed PM. Such arrogance would disturb even the most die hard Tory, wouldn’t it. May and her cronies are the most dishonest and corrupt politicians in my lifetime. They wouldn’t know the truth if it hit them in the face. It’s a clear and blatant power-grab; the bill even includes a provision to allow itself to be rewritten without a parliamentary vote! They could literally change it to say or allow anything they wanted! Give ’em an inch and they will take the whole mile. They really have lost it big time and cant be trusted to play fir at all. Greed rules them. One would hope that they do rip up the additional rights mainly white citizens from only 27 eu nations have over the largely black and coloured citizen of 164 non eu nations, the current bigoted situation should never have been allowed to happen.